Many of us lose sight of our real identity by attaching it to material things. We define ourselves by the clothes we wear, the car we drive, or the house we live in. We become consumed with the daily pursuits that cloak our ego - that make it feel alternately destitute (because of a lack of material things) and charged with false bravado and superficial power (because of an accumulation of material things). In turn, we become disconnected from the deeper part of our self. We forget about the real power, the transformational Self that hides underneath and that is in touch with our highest ideals, both personal and planetary. A lifetime can come and go without our getting in touch with that true part of ourselves and the source of real power. We neglect to ask ourselves what it is that we truly want from our life and, even if we do, most of us fail to really push beyond the simplest answer. Most people answer the question of what they really want by saying that they desire a higher salary or a nicer car or a better home. Others, perhaps a bit more thoughtful, say they want to send their children to the best schools, surround them with security and resources, and ensure that they have bright futures. But if, like a child, you keep asking them why they want these things, most eventually answer that they want them because they assume that achieving these milestones is what will make them most happy. Happiness, in this case, is a state of fulfillment, calm, security, and esteem. And seeing that those we love are safe, secure, fulfilled, and happy makes us happy. In other words, happiness is the key. It is what we are after, even if we create an elaborate scavenger hunt to achieve it. Although bigger, more expensive material things may be symbols of achievement and success, and attendance at the best schools or prestigious places of work may offer security, they are false substitutes for real happiness. Material conquests and prestigious badges are antidotes we use against the ills the ego causes us. Happiness itself and the pursuit of it by helping others gain it are qualities of the higher self. By tapping into and listening to our higher selves, we start to understand what it is we truly want. We are reminded that happiness is a state of being best achieved by alternately both giving and receiving it. And that's the core of what great superheroes like Superman do. Superheroes see attachment to the known as a false sense of security and recognize that the striving for security (our traditional understanding of power) is, ironically, the basis of all insecurity. Superheroes do what needs to be done with impeccabiltiy and the highest motivation for the greatest good and leave the results to the unknown. Their focus is on the action, not on the fruits of that action. Superheroes move through life with fluidity, vision, and idealism. They are not held up by minor inconveniences, physical or emotional, and always view the world in a broad and holistic perspective. And it's these qualities and point of view that form the foundation for their so-called superpowers. As we have discussed, a superpower is a very special ability that results when superheroes connect with their innermost being, which is called the Self. Superheroes realize that this Self of the individual is also the Self of the universe. The ground of their being is the ground of all reality and everything that exists. By acting from this level of being, superheroes are not at the mercy of the environment, but create their own environment. 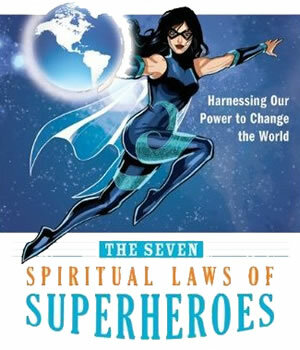 New York Times bestselling author Deepak Chopra, with his son Gotham, decode the seven essential laws that govern the realm of superheroes both ancient and modern, cosmic and commercial, and explain their relevance, importance, and perhaps most critically, how to apply them to our daily lives. These seven new transformative laws will help us all uncover greater happiness, courage, balance, creativity, compassion, and purpose in our lives. Each law has the potential to awaken us to our own superpowers and together these laws offer the potential to change our lives and the world around us. In The Seven Spiritual Laws for Parents: Guiding Your Children to Success and Fulfillment, healer and philosopher Deepak Chopra follows up on his runaway bestseller, The Seven Spiritual Laws of Success, by extending and reinterpreting his spiritual laws for parents. "From the day your baby is born, you are a teacher of spirit," Chopra writes. "Look upon spirituality as a skill in living, since that is what it is. I believe in imparting these skills as early as possible by whatever means a child can understand." To meet this end, Chopra translates his own "laws" so that even the youngest child can comprehend them. For instance, Chopra's First Law, "The source of all creation is pure consciousness ... pure potentiality seeking expression from the unmanifest to the manifest," translates as "everything is possible." In his wise and deceptively simple program (focusing each day of the week on one of the seven laws), Chopra suggests ways for parents to teach children truly spiritual values by incorporating spiritual goals into family life. In this refreshing new take on spirituality, bestselling author Deepak Chopra uses a fictional tale of a comedian and his unlikely mentor to show us a path back to hope, joy, and even enlightenment � with a lot of laughter along the way. After taking the reader on a journey with Mickey, Chopra then spells out the lessons that Mickey�s story imparts to us: ten reasons to be optimistic, even in our challenging world. Chopra believes that the healthiest response to life is laughter from the heart, and even in the face of global turmoil, we can cultivate an internal sense of optimism. 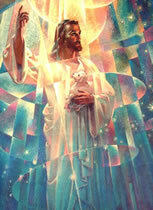 Rich with humor and practical advice, Why Is God Laughing? shows us without a doubt that there is always a reason to be grateful, that every possibility holds the promise of abundance, and that obstacles are simply opportunities in disguise. In the end, we really don�t need a reason to be happy. The power of happiness lies within each of us, just waiting to be unleashed. And Mickey Fellows�s journey shows us the way. Chopra presents five 'breakthroughs' that address the body and five that address the soul. He also walks readers through a fascinating discussion of how energy affects spiritual and physical health, and includes a scored personal energy efficiency quiz. According to Chopra, when 'subtle energy' becomes blocked, awareness can act like an invisible force that turns unhealthy energy around (he also explains how the expression of genes can be altered by lifestyle changes). Chopra encourages readers to follow their inner guidance, to embrace a journey to higher consciousness, to expand awareness through meditation and other methods, to ask for guidance and then wait for it to appear, and to trust their instincts. By accepting the over-arching power of the 'invisible' or non-physical world, Chopra maintains that we can begin to nourish a state of wholeness in which there is no longer a disconnect between body, mind, and soul. The message of this book? "We are not victims of aging, sickness, and death. These are part of the scenery, not of the seer, who is immune to any form of change. 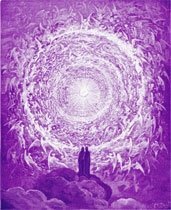 This seer is the spirit, the expression of eternal being." The basis for his belief, Chopra argues, is quantum physics and the work of such scientists as Heisenberg, Bohr and Einstein, with whose help Chopra proposes to tell us how to stave off the inevitable changes brought on by mortality and the passing of years. He advises us on how to "defeat entropy," to "believe" enough to offer palpable resistance to processes of physical alteration, and to "reinterpret your body" such that renewal will come of it. He himself believes in "a land where no one is old," and where "we create our bodies as we create the experience of our world." He is also a proponent of "the science of longevity," and cites research by doctors to back himself up when expounding upon it. Chopra, who has spent his career exploring the mind-body connection and helping people develop their spirituality, brings his expertise to teens' questions. The book centers on questions Chopra has received from teenagers in person and online. The topics are divided into subjects such as success, well being, relationships, and God. The book is at its best when Chopra is explaining his spiritual philosophy, one that transcends organized religion and focuses on the underlying connectedness in the world and on the everyday miracles pervading life. Deepak Chopra considers the mystery of our existence and its significance in our eternal quest for happiness. Who am I? Where did I come from? Where do I go when I die? Chopra draws upon the ancient philosophy of Vedanta and the findings of modern science to help us understand and experience our true nature, which is a field of pure consciousness. When we understand our true nature, we begin to live from the source of true happiness, which is not mere happiness for this or that reason, but true inner joy. When we know who we are, we allow the universe to flow through us with effortless ease, and our lives are infused with power, freedom, and grace. Chopra and his colleagues at the Chopra Center for Well Being offer pregnant women, their partners and healthcare providers a practical, thought-provoking framework in which to experience pregnancy and childbirth. Chopra advocates techniques drawn from ayurveda, the centuries-old Indian medical science, combined with daily yoga and meditation practice, to help deepen a woman's connection to herself, her baby and her own intuitive wisdom. Chopra says that the months during which a woman carries a child are a naturally introspective period and provide an ideal opportunity to cultivate awareness of physical, mental, emotional and spiritual states. To facilitate this process, the Chopra Center developed the Magical Beginnings program for parents and training programs for prenatal educators to aid them in integrating ayurvedic therapies (focused on nutrition, sound, sight, touch and aroma), meditation, yoga, visualization and journaling into a holistic approach to pregnancy. According to Chopra, Western images of childbirth can instill unconscious fears, causing undue stress to mother and child. To help women tackle these worries, he offers helpful medical information on the physical aspects of childbirth, ways to process difficult emotions, and suggestions for healthy communication between partners. In addition to pregnant women and their caretakers, readers interested in birthing and raising conscious children will likely be inspired by Chopra's stirring call for mindful parenting from conception through birth and beyond. This guide is written in such a clear, sensible way that those new to yoga will wonder why they've not tried it before. Seasoned practitioners will find themselves reinvigorated and may learn a new breathing technique or meditation. Starting with descriptions of the two most popular frameworks, Shankara and Patanjali, the authors then list the seven laws of spirituality that neatly correspond to the seven days of the week. Extensive explanations of several types of meditation�chakra, so hum breath technique, awareness, attention/intention�are followed by the most common breathing exercises and thorough instructions for a variety of asanas (poses). Photographs complete the instructional portion of the book, making it especially useful for beginners. The final pages bring the program together with a suggested routine that combines all of the above into a perfect blend of theory and practice.